Sunset at Miri inspires this Kaizan. Miri, 8 May 2009. You least expect a bamboo flute to be the main draw of a jazz act, especially when it’s shaped like nothing you have ever seen before. The shakuhachi’s tale is as old as the ancient moso bamboo groves in Japan, but the five-holed instrument is given a twist and swish to produce haunting sounds under the mastery of John Kaizan Neptune. It held me spellbound, and scores of others too at the 4th Miri Jazz International Festival in Sarawak, organised by Sarawak Tourism Board in May.Holding the instrument sacredly and backed by an ensemble of drums and guitar, John produces mellow tones that slither from meditation to folk, sliding into Indian fusion, submerging as jazz then surfacing again as Asian fusion. Listen to some samples here and you will understand the fluidity described. Confused? Do not fault yourself if you cannot define his music. “Music is not a product, but a process,” tells John, as we sit under the breezy rows of pines along the picturesque Miri coastline. I was keen to know more about this seemingly mysterious musician who makes his own instrument and blows in it too. And he cuts a striking figure on stage with Japanese garb complete with headscarf. There must be a story behind this iconic music maker – a damn good one. Growing up in California, all John could think of was to surf and hit the loud notes in his rock band. The self-confessed school dropout couldn’t figure out what he wanted to do in life – he was just too much into music, playing the drums and trumpet. He also mused about World Music and Eastern philosophy. But all he really wanted to do was surf, so he took the best option – going to college in Hawaii in 1971. There he enrolled to study something intriguing called ethnomusicology. He also wanted to master playing an instrument he was keen on, which was the tabla, an Indian drum. “I couldn’t find someone to teach me the tabla, but I met a Japanese Buddhist monk on the street who played the shakuhachi,” he said. 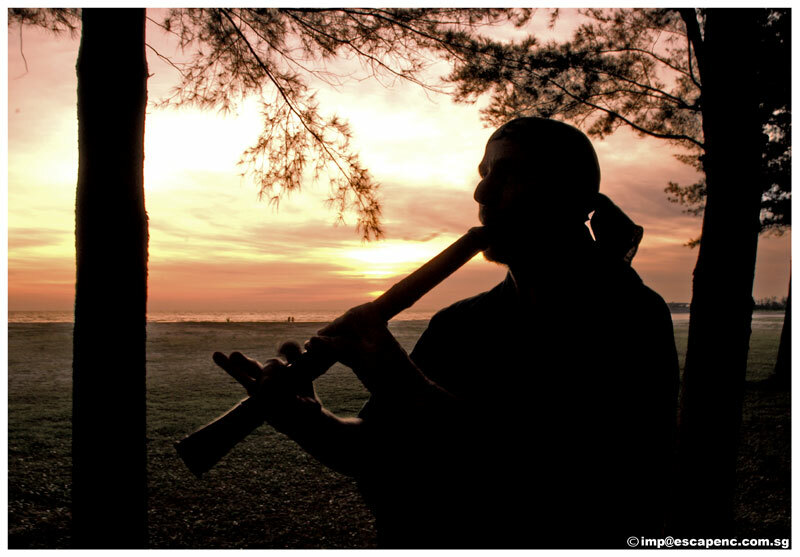 John found that the instrument traditionally used in meditation tool quite amazing, sounding like a flute with high notes, and raspy like a sax on the lows. “One-note enlightenment” is a Japanese phrase that is referred to in meditation, explains John where the musical tones produced to help with meditation are kept “deliberately simplified, throwing out rhythm”. Following a long one note, there is then “space”. During this space, according to John, the musician draws his breath or contemplates while the audience waits. “In the background, someone may cough or drink noisily while waiting for the flautist to make his next note,” John explains. It didn’t matter. Space is an important concept in John’s musical rendition. I found this weird. So I asked why. One-note enlightenment takes you places. “Space is there because nothing is ever important,” he says. And the musician’s pause is a reminder to all that nothing ever has to move at bullet speed, I am told; life should be lived in the present for all its worth. “When I play, I can send you, take you with one sound,” says John. The simplicity then broadens to embrace complex rhythms such as the South Indian raga or scale “pantuvaralli” (A flat, A, C, D, E flat, E,G) in the composition “Touch of Blue”. In “Manju Nigar” based on a traditional Tamil pilgrim song, the rhythmic cycle of 7 (misra chapu) sets an exciting framework of accompaniment to the vocals of Visalakshi Nityanand. “There’s an energy produced that we can all participate in, and to share,” says John. Sharing his music is his goal in life, as John seeks to craft his own instruments apart from redefining music. The uduboo is a new drum invented by John. The two-holed body is made of laminated pine based on the African clay pot “udu” while the head is made of bamboo “boo”. The new instrument is used in the all bamboo ensemble TakeDake, meaning BambooOnly, which also uses musical instruments mostly made by John himself. “I want to share my music more with the community, be it retirement homes or schools. Drums are easier (to pick up). So I am making more of the uduboo to share it with the community,” says John of his future plans. “They are also ecologically positive,” he adds. The patented uduboo is all-natural with little environmental impact. It is harvested from giant or moso bamboos in Kyushu, Japan. They can grow very tall and as large as 72cm in diameter. When ready for harvesting, John cuts the bamboo and shapes it to musical beings such as the bambass or uduboo. “Harvesting the bamboo - digging it up (the root portion is used), curing and drying it for about two years, inlaying the mouthpiece, drilling the holes, shaping the bore, and finally lacquering the inside is a demanding process, but one that is very interesting and rewarding,” writes John on his website. “I want to get the vibrations out and share them,” smiles John, who was awarded the honorary title of “Kaizan” or “Sea Mountain” in 1979 following his achievements in mastering the shakuhachi in Japan. 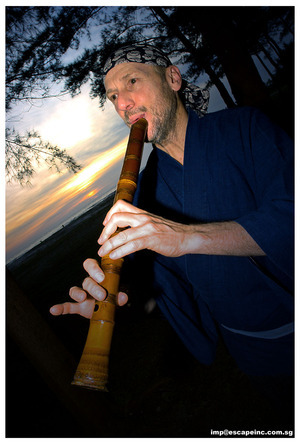 John Kaizan Neptune has since wowed the world in many international tours with his adaptation of the shakuhachi in contemporary music, particularly jazz and cross-cultures. He has released more than 20 albums with various musicians, with the latest release Bamboo Magic in 2007. The magic of John Kaizan Neptune’s bamboo works indeed swept over me at the Miri International Jazz Festival in charming Sarawak. Artistic Director Randy Raine-Reusch interviewed on 12th Rainforest World Music Festival in Kuching, Sarawak. 4th Miri International Jazz Festival reviewed.